First of all, I want to say thank you to the dozens of people who gave me a financial gift at the birth of our fourth son, Spurgeon. That was unexpected. 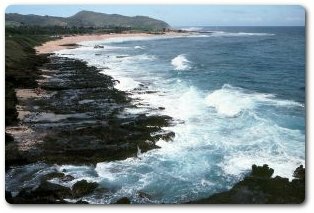 When Greg Linscott and Brian McCrorie asked me what I wanted, I told them that assistance to get my family to Hawaii would be wonderful. I was asked to speak for three weeks at the Independent Baptist Camps of Oahu, and I decided to take my whole family. My ticket is paid for by the camp, but that left me with four more tickets to purchase. So your gift paid for my wife’s ticket, and it gives us $300 to get away to the other side of the island (the opposite side from our kids) for a few days. Thank you so much. SI is a labor of love for me, and I would do it without any benefits, but the benefits have been supreme. My wife and I just had Dan and Addy Forrest over to our home and had a wonderful time. Addy is a budding writer, and Dan is finishing up his doctorate in music at the University of Kansas. We did not know either one of them before the launch of SI. The greatest advantage of running the site has been the development of new and old relationships with people all over the world. The SI family has added a wonderful dimension to our lives. So I will be out-of-pocket until July 9th. Greg Linscott is officially in charge of the site while I am gone, so if the insurgents would like to do a hostile takeover, now’s your best shot! Second, I want to introduce you to a new staff member here at SI, Adam Blumer. Adam served as editorial manager at Northland Baptist Bible College for the last decade. He is working for a couple ministries from home and offers editing, writing, web updating, and proofreading services (www.blumer.org/adam). I have hired Adam mainly to work on soliciting advertising, posting articles, and lining up our author calendar. He has done a splendid job so far. Writers are really coming out of the woodwork, so if you’d like to write for SI, your first step would be to contact him at adam@blumer.org. Third, SI is now incorporated as Sharper Iron, Inc. We are currently paying for several individuals to work on the site, for monthly bandwidth use, and for several small miscellaneous items. If you would like to help SI, you can do so by directing potential advertisers our way. I do not want to solicit donations. We are not a nonprofit corporation, and I want to be upfront about how the site operates. We are currently seeing 25,000 unique visitors every month. We are on track this month to have one million page views. Web advertising is more effective than print ads and more cost-effective, and it reaches an educated audience. Advertisers can take out a six-month contract on SI for $300 and have thousands of people see their ad and be able to be linked directly to a point-of-purchase. Also, our software program allows our clients to change their ads as often as they would like. International Baptist College has done a great job of changing out their ads over the course of their contract in order to create interest and traffic. Fourth, we have pretty much recovered from the crash. We lost data on about 400 members, but we’ve had more than that join in the last two months. We have been able to recover all of the original articles. We will gradually re-post them over the course of the rest of the year. We have made several improvements. Our blog software now allows us to do many things we were unable to do before. Our cross-traffic within the blogosphere has improved. Also, Austin added “The Foundry,” which has been a big hit. I would like to see more members use the “Ranking” feature on articles as it would bring good writing to the forefront. Greg will be adding several new blogs to the blogroll in the next week. You will appreciate the new writers. Greg has also pioneered the “Filings” blog on the front page. The almost-all-seeing web prowler now has an outlet for his nose for news. Hopefully, the archives has been helpful to many in their search for articles. If we can help local church leaders in their daily ministry, this site will be a success in my eyes. 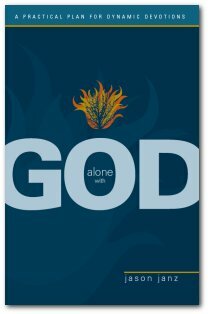 Last, I just published a book through BJU Press titled Alone With God. It became available for purchase just yesterday. 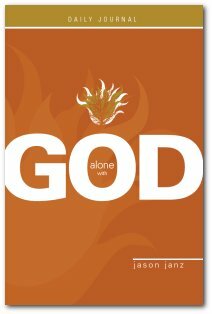 It’s a book designed to help individuals have a meaningful time of daily devotions. I created an eight-step plan that involves prayer, music, Bible reading, responsive readings, and journaling. BJU has published an accompanying journal as well. I will officially launch the book here on SI in late July, but if you’d like to order a copy before then, you can do so at the BJU Press website. I have a book signing at the CBA convention on July 11. Interestingly enough, the BJU Press booth will be right next to Focus on the Family and Left Behind Games, and directly across from me will be Christianity Today. You can pray that I’ll be a good boy! George Barna is going to be there as well. I have contacted him, asking him for an interview. We’ll see how that goes. Also, my good buddy Randy Alcorn will be giving a presentation. The plot thickens. I look forward to connecting with everyone again upon my return. Don’t cry for me. :) I’ve been given much more than I ever deserve.